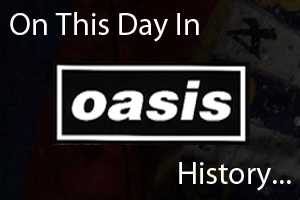 On August 10th 1996, Oasis played the first of two nights at Knebworth. Support for the two days included The Prodigy, Ocean Colour Scene, Charlatans, Manic Street Preachers, Kula Shaker and Dreadzone. Below is a review from THE TIMES of the show. One in 20 Britons applied for tickets to see Oasis in concert at Knebworth. Our critic joined the crowd on Saturday. Three million people, 5 per cent of the population, applied for tickets and those lucky enough to get them were treated to two new songs, My Big Mouth and It's Getting Better Man , along with tried and tested hits. With a guest list of 7,000 there were plenty of opportunities for star-spotting: Mick Hucknall of Simply Red, Jarvis Cocker and Kate Moss made their way to the celebrity enclosure to compare bodyguards with Liam Gallagher and Patsy Kensit, and all looked disingenuously surprised when mobbed by amateur paparazzi. For those not chosen as Kate Moss's plus one, there were tickets still available at a price. Cro-Magnon touts were willing to get you into "The Gig of the Decade" for £300, a sizeable mark-up from £22.50. Once inside, many would have gladly paid £300 to avoid queues. There were 400-yard tailbacks for each bar and toilet. But with the temperature into the 70s and a PA so powerful everyone was guaranteed to leave touched by tinnitus, such matters were of little importance. Oasis took to the stage at 9pm, greeted by a roar so huge that flocks of birds took to the sky from Knebworth's old oaks. "Hello, hello, hello," Liam said, making a fairly good job of John Lennon's famous "retard" impression. "Let's go." And off they went, kicking out the music that has made the Top 40 truly exciting for the first time in ten years and working hard for the estimated £5.6 million the weekend accrued. Joined for the inevitable encore of Champagne Supernova by The Stone Roses's ex-guitar player John Squire, Oasis bowed out in a blaze of guitar solos and a firework display. As many tired and emotional punters fell over backwards, disorientated from staring at the sky so long, Martin Carr of the Boo Radleys said: "Everyone in Britain - except Damon from Blur - loves Oasis. They can do no wrong." He would appear to be right.